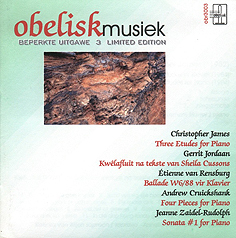 Obelisk Music was founded in Pretoria in July 1991, and the first concert organized by the organisation happened in February 1992 in the same city. The founder members of this organisation dedicated to the advancement of South African New Music were the Étienne van Rensburg, Johannes van Eeden and the late Christopher James. For ten years Obelisk Music was the only organisation dedicated to providing South African composers with an opportunity to have their works performed in Pretoria. It was arguably also the most successful organisation of its kind in the country up to that time. Concerts were held in the State Theatre and the Musaion at the University of Pretoria and limited edition commercial CDs of music performed during concerts were released. Some of the music recorded in this way include such unknown works as Andrew Cruickshank’s Red clouds breaking bird song and Four pieces for piano, Bongani Ndodana’s But there went up a mist watering the face of the ground en John Coulter’s O Tshwanetse Go Reetsa. The activities of Obelisk Music ceased in the early 21st century, although the organisation was never officially dissolved. 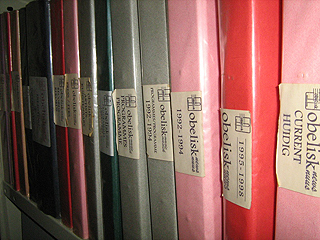 With the help of the Music Library, DOMUS acquired the scores, recordings and documents of Obelisk Music in July 2008. Not only does this mean that music and recorded music previously unavailable to students, researchers and performers can now be consulted, it also means that the documentary material of Obelisk Music is available to researchers. This is important, as the collection provides a perspective on South African art music practice in the last decade of the twentieth century in the capital city of a South Africa that was undergoing the most profound political changes in generations.